This post is sponsored by Bob’s Red Mill. 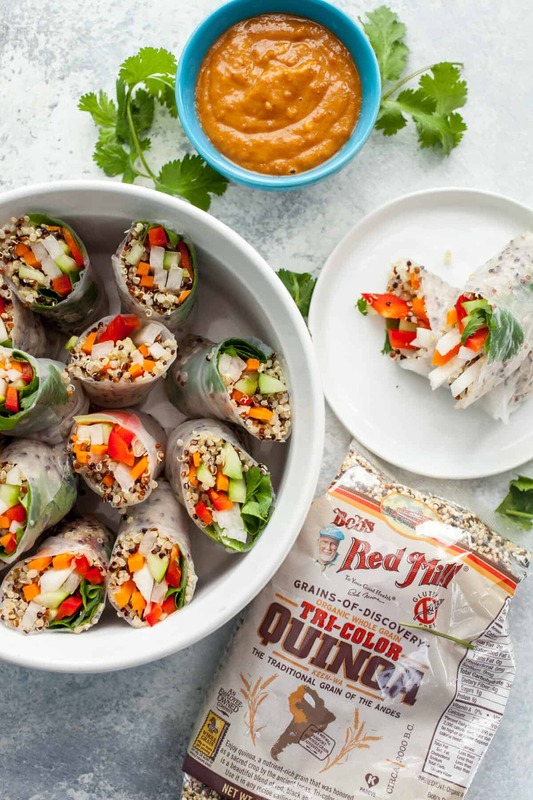 They make a huge range of quality products including the Tri-Color Quinoa I used for these spring rolls. Check them out on Facebook and follow them on Instagram for lots of fun recipe ideas. I assume you spent this last Easter weekend like I did: sneaking my 3-year old’s candy when he wasn’t looking. That’s the responsible parent thing to do right? I eat as much candy as possible on the sly. The candy disappears. He still gets some candy. Life goes on. I eat no candy. He eats all the candy. He never sleeps again. Maybe there are other options, but who’s to say right?! Anyway, I chose option one and now I’m craving something bright, naturally colorful, and healthy. 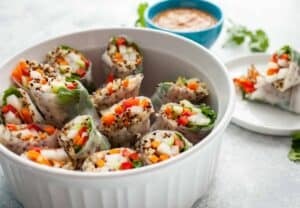 These Quinoa Spring Rolls are all of those things, but they don’t exactly taste like healthy food. They taste like delicious food! The rolls themselves have a great crunch and are filling enough to eat as a meal. They are fine on their own, but I serve them with a kicked up chili garlic peanut sauce which takes them to another level. Start off April (and spring) on a healthy note! These bright and crunchy spring rolls are filled with Tri-Color quinoa. I like to serve them with a simple spicy peanut sauce. 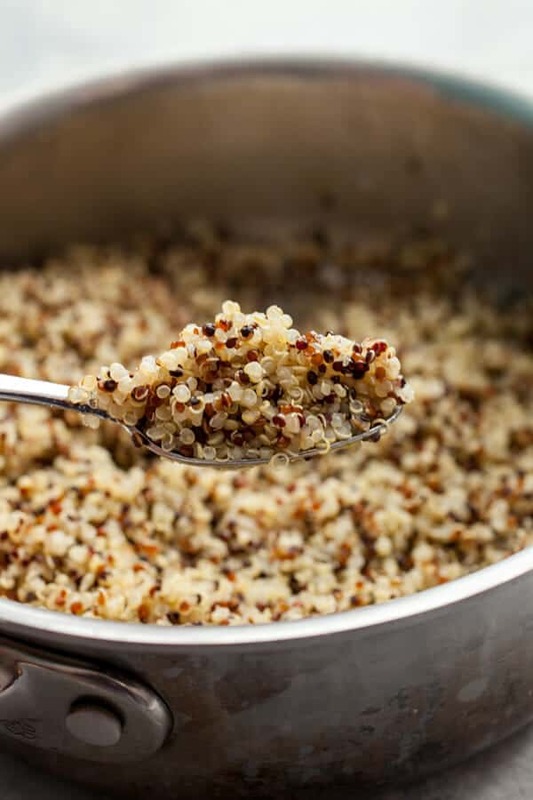 Cook quinoa by rinsing it well in cold water. Then add it to a pot with 2 cups boiling water. Stir to separate grains and turn heat down to low. Cover and cook quinoa for 12-15 minutes until the grains have mostly sprouted. Drain off any extra water at this point and return to the hot pot. Remove from heat, cover, and let steam for 5 minutes. Then fluff with a fork and cool to room temperature. Meanwhile, stir together sauce ingredients and prepare all your veggies. 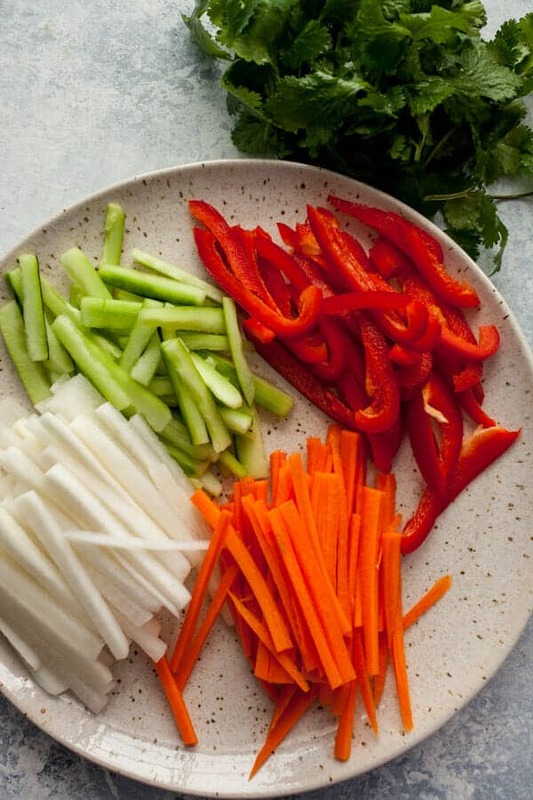 Take your time slicing so the peppers, cucumber, daikon, and carrot are the same size sticks. 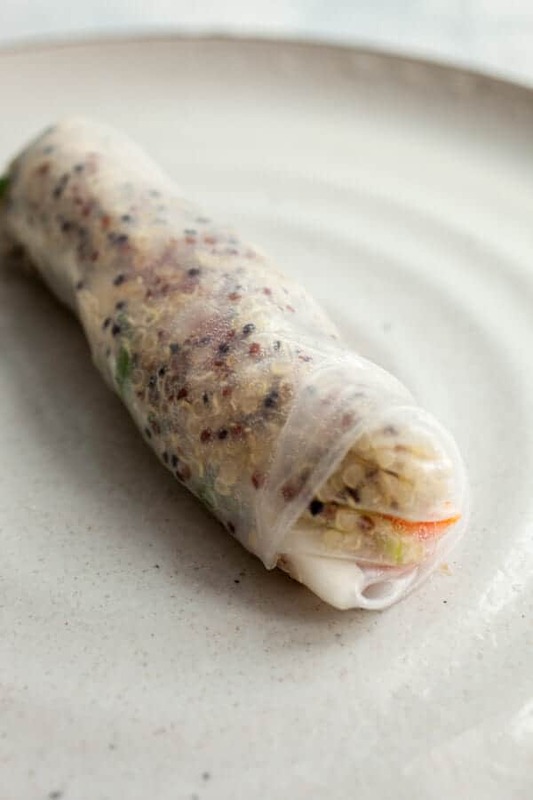 To make a spring roll, set a rice paper sheet in a shallow dish with warm water. Let it sit for 5 seconds and flip. Do that a few times until the wrapper is flexible. Then transfer it to a clean surface. In the middle of the wrapper, add about two tablespoons of cooked quinoa, then a few sticks of each veggie. Add some cilantro (optional). Fold the ends of the wrapper over and roll it into a tight cylinder, pulling on the wrapper as you roll it to keep it nice and tight. Cut wrap in half for serving and repeat until you are out of fillings. You should get about a dozen spring rolls. Serve spring rolls with sauce on the side. Extra spring rolls will keep in the fridge for a day although they will dry out a bit during storage. This is my new favorite quinoa. It’s a really high quality quinoa that cooks up fluffy and delicious. And I love the color mix! 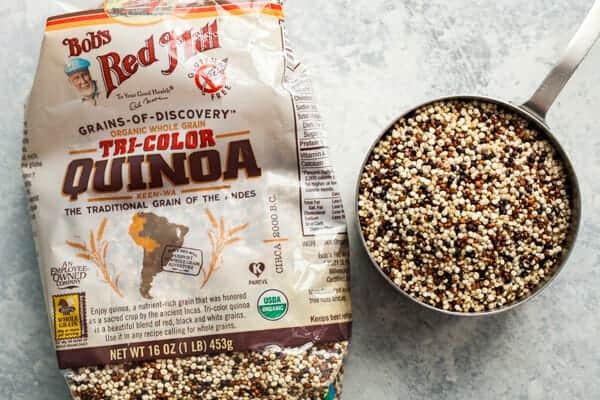 The number one problem I see with quinoa is people overcooking it. The key to cooking it is to simmer it over low heat, covered, for about 12-15 minutes. When you start to see the grains “sprout”, you know they are getting tender. At that point, it’s important to drain off any extra water in your pot and let the quinoa steam to finish cooking (off the heat). After five minutes or so of steaming you can fluff the quinoa with a fork and it’ll be light, airy, and each grain should be separated. If it’s a mushy sticky mess, you overcooked it. Meanwhile, mix up some sauce. 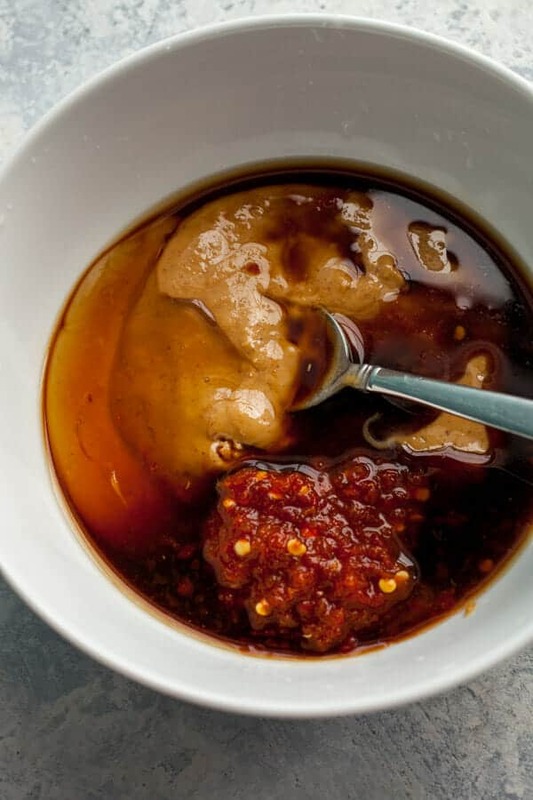 This is a really easy peanut sauce and would be good for almost any dipping situation. Keep it in your back pocket (the recipe, not the sauce). Besides sauce and quinoa, we just need some good crunchy veggies! I chose red peppers, cucumber, carrot, and daikon. You could use others or not all of these. It’s flexible. 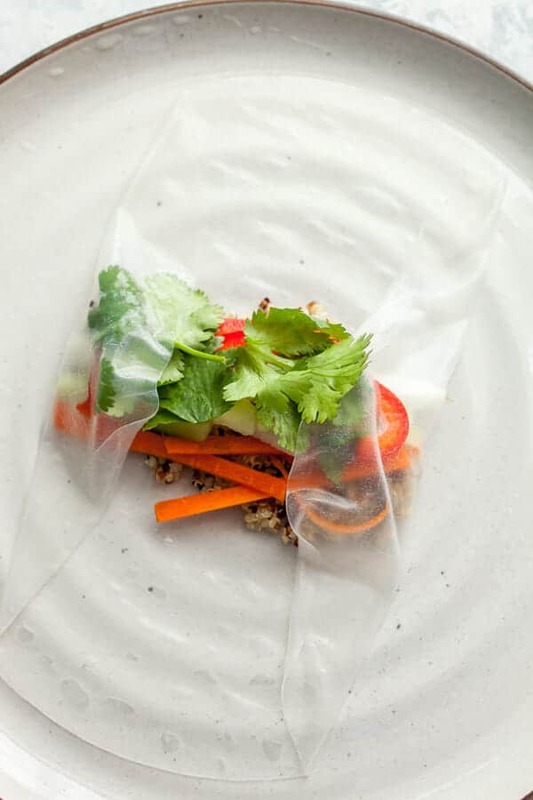 When you’re ready to make a roll, let your rice paper wrappers sit in hot water for a few seconds to loosen up. Then move one to a clean surface and add a few tablespoons of quinoa, veggies, cilantro, and roll it up like a burrito. I know rice paper looks really fragile, but it’s actually sturdier than a flour tortilla. Not kidding! Once you get the hang of making these, you can finish them pretty quickly. The key with spring rolls is to make sure you pull on the wrapper as you roll to keep it nice and tight. I like to serve the spring rolls chopped in half to show off the goodies. These are a great healthy appetizer or you could take them to a picnic. Stack up a few of them and I have no problem making a meal out of them. 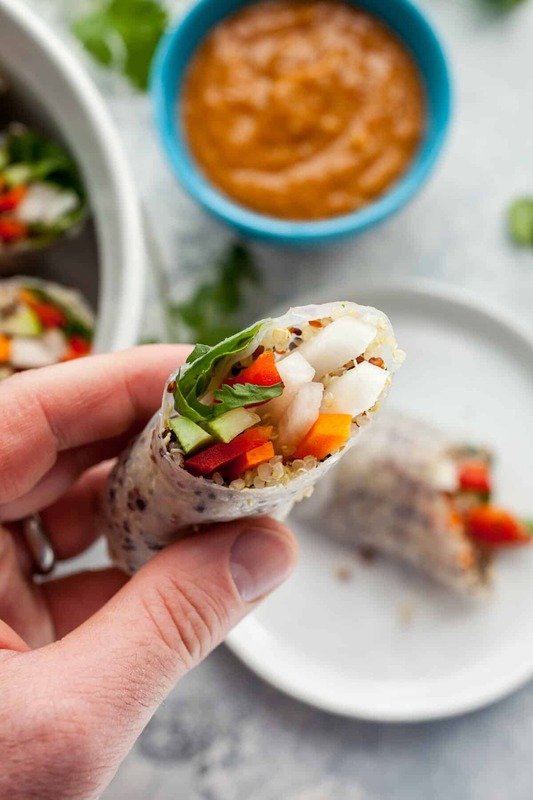 You can feel really good about eating and serving these quinoa spring rolls and bonus points if you can convince a three year old to try one. HINT: Tell them it will give them lots of POWER. These would make a great item for lunch! I just received some Freekeh from Bob’s Red Mill nd I think it would work very well here. I will give it a try!! These spring rolls look delicious. I am always on the lookout for healthy but still tasty food I can make.